Four years ago, John and I started a campaign to get the play facilities between King Arthur Drive and Merlin Close upgraded . The old area was in poor repair, but a worse problem was that it had very little “play value” for local children and it was starting to attract anti-social behaviour. Over the last few years we have been working with a local housing association and Preston Academy to get the design right. We’re really pleased that the new area has now been completed. It has challenging play elements for all ages (as you see!) 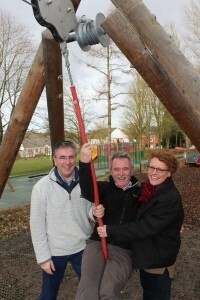 including a zip wire, role play, climbing, rope swings and lots of toddlers features. We have also managed to get some funding to improve the football pitch drainage, however the grass is going to take a little time to get right, simply because of the heavy use! The new area should be opening on 11th April and will be formally named then.